Option 1: Take a panorama on your iOS device or Samsung Galaxy phone (the image must cover 100 degrees or more to work as a 360 image when you post it to Facebook). Option 2: Take a 360-degree photo on your smartphone using an app that supports taking 360 degree photos and videos. Using this option is a bit more complicated, and you may have to ensure that your photo covers a full 360 degrees. Open the Facebook app (this needs the latest version) and share the photo as you would any other photo: tap the status tool from the top of your Timeline or News Feed, select Photo/Video, choose the photo you want to share, and tap Post. You will know that your image is going to work when you see the little compass icon showing on your photo before you upload it. Once your photo is posted, look around in your photo — or any other 360 photo in your News Feed that’s marked with the compass icon — by moving your phone or dragging with your finger. Tap on the photo to view it in full screen. The advances in virtual reality have opened up a bunch of opportunities for hoteliers, travel, fashion, and retail, sports, hospitality, tourism, entertainment, real estate industry etc. For example, videos and photographs have always been a model of inspiration for people to travel, and if you give your guests the ability to step into your hotel virtually without leaving their homes might be an encouragement for them to decide to visit you in real life. Real estate companies: They can attract customers by posting a 360 degree video online which allows them to have a good view of the property and amenities. They can provide the customers with virtual reality headsets for a better experience. Customers could experience the property by sitting at home or at their convenience. Travel & tourism companies: Travel companies can upload 360 degree videos or photos of popular or famous destinations. They can also add text in the video to highlight about famous buildings or locations in the video/ photo. Fashion and retail companies: Fashion companies can showcase their events, parties, collection launch etc. using the 360 degree videos or photos. Retail spaces can also use the same for showcasing their new stores, collections, offers, events in the stores etc. Sports companies: Sports companies can telecast matches using this platform. They may even upload the preparation of any big sports event or the arena at the time of the event. Entertainment companies: Entertainment companies can use this platform for multiple uses. Entertainment companies can use it for promotions of their events or films, making the film, sets of films or events, theme or amusement parks etc. Many Hollywood and Indian movie production houses have adopted this platform. Transport companies: Transport companies such as airlines, motor vehicle companies can use this platform to showcase their vehicles, flights etc. Recently, Lufthansa and Mercedes came up with their 360 videos. Lufthansa came up with a video about a boy who forgets his football in the flight and how does he get it back. Electronics companies: These companies can create campaigns related their products, brand or social awareness. They can use the 360 degree videos to do so. Samsung Gulf came up with a campaign called #BeFearless. Telecom companies: Telecom companies can create 360 degree posts on Facebook to showcase their services and the quality of their services. For example, AT&T did a #StrongCan campaign, for which they shot a 360-degree video of race-car driver Ben Albano streaming his practice laps to his coach in another state using AT&T’s wireless network. 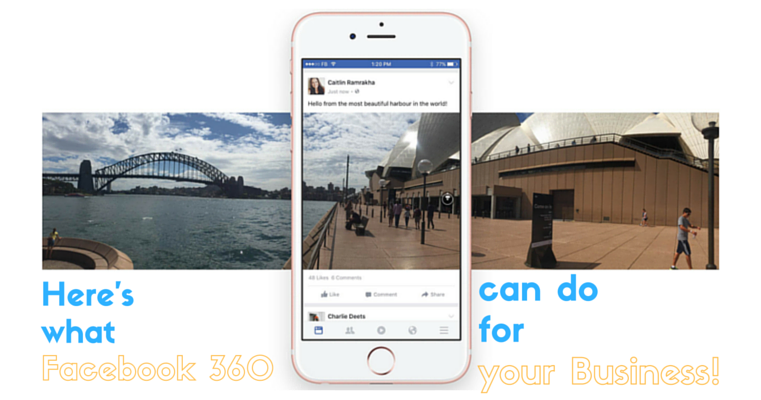 Facebook’s 360 degree posts are taking the market by a storm and it is one of the upcoming ways to market your product or service. I would like to know more about your ideas and thoughts on the topic! Kindly share them in the comments section below.